Known for its “cool” menthol fragrance and flavor, mint is also extremely easy and fast to grow, making it a perfect starter plant for the aspiring gardener. Peppermint has a number of reported natural medicinal uses including relief for an upset stomach, allergies and muscles spasms, to name a few. It contains menthol which is a natural decongestant. In addition, tea made with its leaves can, reportedly, relieve a sore throat. It is commonly applied topically to soothe skin irritations and is used in aromatherapy. It is a natural anti-microbial and can be used to freshen breath. There is evidence that peppermint repels mosquitoes outside in the yard. And backyard chicken farmers report that it can help control parasites in the flock. Like most herbs, peppermint can be dried or frozen for later use in a variety of applications. 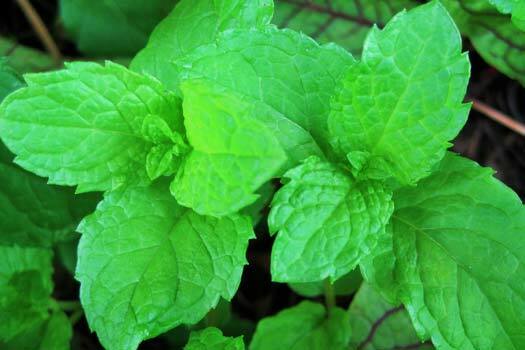 Peppermint—Mentha x piperita—is a natural cross between water mint and spearmint. It was initially cultivated in England in the late 17th century. Today, it is widely grown throughout North America and Europe. Full sun or part shade. In hot climates, shade is helpful. While mature mint plants are drought tolerant, freshly-planted seeds and newly established plants should receive gentle, regular watering to keep them consistently moist but not soaking wet. Hardy mint adapts to many types of reasonably well-drained soil, once established. For best results starting seeds, soil should be 70°F. Once established, mint will tolerate a wide range of above-freezing temperatures. Start mint seeds indoors about 8-10 weeks before your last anticipated spring frost or direct seed outdoors after the threat of frost has passed. Plant seeds ¼ inches deep, tamp down soil and gently sprinkle with water. Thin and space according to seed packet instructions. Seeding to maturity generally takes 90 days or so. Mint doesn’t need any help to grow! Mint is susceptible to fungal diseases which can be mitigated with good air circulation and morning watering. It’s also targeted by various insect pests such as aphids, mites, thrips and cutworms. Quick online research reveals solutions to these problems. Mint is a vigorous grower that can quickly become invasive if you don’t control it. Methods of control including planting/transplanting it in open-on-both-end containers in the ground or aggressively cutting back runners and pinching plant tips. Mint is a helpful companion to a number of other vegetable plants including: beets, broccoli, brussel sprouts, cabbage, eggplant, kale, lettuce and peppers. The health and flavor of peas, cabbage and tomato plants will be enhanced by the proximity of mint. Yes! Shallow-rooted mint will thrive in a variety of pots and containers. You can start to harvest mint leaves once the plants have multiple stems that are at least 6 inches long; you can continually harvest thereafter. Pinch off flowers as they appear to conserve the flavor of the leaves and essential oil content. Fragrant and delicious, mint conjures up images of relaxing summer afternoons spent outside on the porch enjoying a refreshing beverage with family and friends. If you’re new to gardening, consider putting mint at the top of your list of “crops” to plant. Not only is it easy to grow, it’s also hardy and prolific and will provide you with an abundant harvest for years to come. Unfussy and fast-growing, mint will spread rapidly in your garden or pots and can become an invasive nuisance if you don’t take active measures to control it. Mint makes excellent seasonal ground cover for large areas or to fill in tight spaces between walkway pavers. Packed with antioxidants, mint contains vitamins A and C, as well as potassium, magnesium, calcium, phosphorus and iron.